Check box(es) for bottles, change quantity if more desired. Then Click add to cart button. This is TRUE BLUE Colored Glass. It is not painted or frosted. It is Clear Blue. 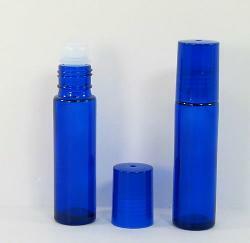 These 1/3 fl oz (10 ml) Roll-on Perfume bottle can also be used to apply carrier oils to lips. It comes unassembled for ease of filling. Once filled simply 'snap' on the roller ball assembly. A tight fitting cap keeps your product from leaking. They are 3 1/4 inches tall with cap on and 3/4 inches in diameter. The parts that are included with each bottle are pictured. You can put any oil based perfume in them! 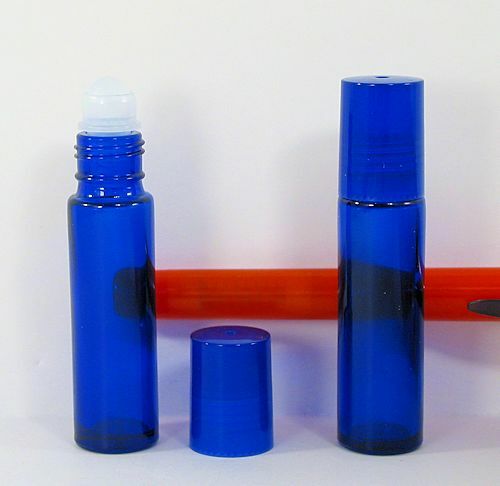 Simply add your oils to the bottle, insert the ball holding part, insert the ball and twist on the cap! Idea for MASSAGE THERAPISTS: Mix your Massage oil blend for individual clients - Don't forget to put a label on for use at each of their massage sessions. 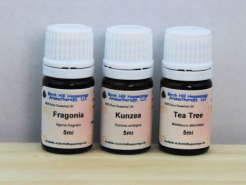 Or you can purchase our larger bottles of "Fresh For You" Massage blends and divide them in several bottles. Can also be used with light lotions for easy application over large areas.